A more equitable and democratic world where all people develop agency and power to shape their lives and communities. 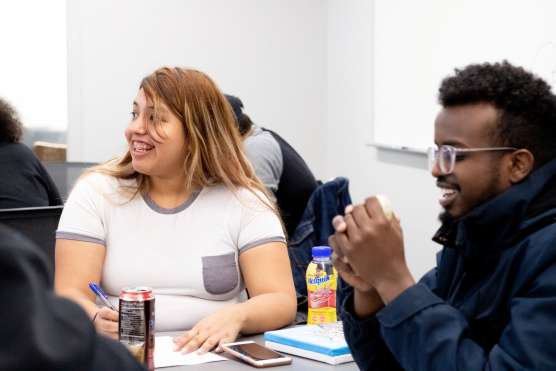 Community Connector: We steward Augsburg’s commitments to place-based community engagement, connecting campus and community through partnerships, classes, and more. Leadership Incubator: We cultivate transformational public leadership through programs that build individual and collective power. Change Catalyst: We coach, consult, train, and host events that build public skills and educate participants to make change in their own communities. Democracy Laboratory: Our work integrates civic and community engagement, experiential education, and democracy building. Utilizing a public work framework, we engage with students, scholars, and community members to co-create democracy in our communities and in our institutions. The Sabo Center for Democracy and Citizenship integrates two rich histories and initiatives in community engagement and democracy building into a single, vibrant center with local, regional, national, and global reach. 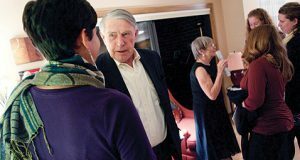 The former Sabo Center for Citizenship and Learning at Augsburg University included a constellation of programs and themes that honored the legacy of Congressman Martin Olav Sabo ’59. These included public and community service, service learning, public policy, deliberative practices, and community development work. The Center for Democracy and Citizenship, which moved to Augsburg from the Humphrey School of Public Affairs (University of Minnesota) in 2009, located its philosophical roots and day-to-day work in the citizenship education programs of the southern civil rights movement, in the settlement house movement and leadership of Jane Addams, and in the theory and practice of public work. The Sabo Center for Citizenship and Learning and the Center for Democracy and Citizenship combined into a single entity at Augsburg in 2014, bringing together these two traditions of public service and citizen engagement. Today, the Sabo Center for Democracy and Citizenship is recognized for its innovative leadership in democracy education, public work philosophy, experiential learning, and place-based engagement. Congressman Martin Olav Sabo ’59 was a lifelong public servant who exemplified the progressive approach and personal integrity that were modeled in his Lutheran upbringing and education. One year after graduating from Augsburg, Sabo—then 22—was elected to the Minnesota House of Representatives. During his tenure, he became the first member of the Democrat-Farmer-Labor party to serve as Speaker of the House—a post he held from 1973-78. He went on to represent Minnesota’s Fifth Congressional District in the U.S. House of Representatives for 28 years, retiring in 2007. To read about Martin Sabo’s last days in his U.S. House office, go to page 18 of the Spring 2007 issue of Augsburg Now. Civic engagement is a result of good citizenship. Successful political process depends on deliberative practice. Political leadership is a vocation in democracy. The art of politics is about how to get things done. Good decisions should be guided by values. Democracy is the day-to-day work of people innovating together to solve problems. Our work is informed by the belief that everyone has the power to make change in their communities, and that higher education has an important role to play in building democratic practice in society. Read more about democracy. Public work philosophy understands citizenship as the ongoing work of all of us in all public-facing aspects of our lives–including our professional identities and workplaces. Learn more about public work. Our community-based work is focused on long-term, reciprocal, and deliberative partnerships that center community-identified goals and lead to self-determination for all parties involved, and is grounded in Augsburg’s commitment to our neighborhood. Read more about our place-based commitment. Experiential education is a holistic learning philosophy that utilizes direct experience and focused reflection as a means to learn. Experiential education infuses almost all aspects of The Sabo Center’s work, and is part of a culture and long-time commitment to experiential education at Augsburg. Learn more about experiential education at Augsburg University.